In the middle of a busy life, I found a willingness to love. I’ve had several awakenings and this book captures the heart of what I have discovered. It is about the journey of awakening, not just my awakening but yours as well. 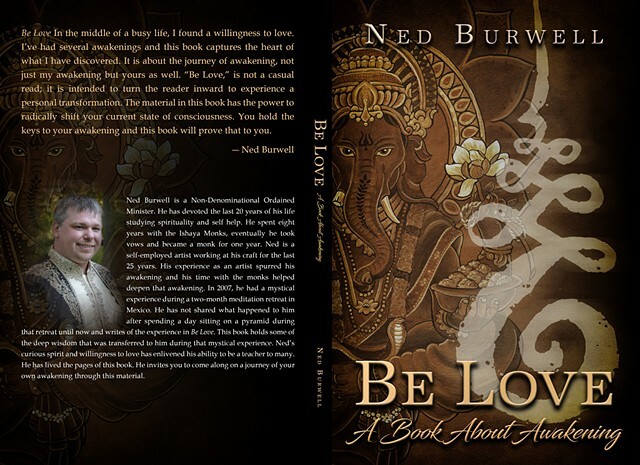 “Be Love,” is not a casual read; it is intended to turn the reader inward to experience a personal transformation. The material in this book has the power to radically shift your current state of consciousness. You hold the keys to your awakening and this book will prove that to you. The beginning of the book deals more with subjectivity, understanding your inner world. It then progresses into a more objective focus in the middle. All of which sets you up to go deeper in the final chapters. This book ends with a strong spiritual focus, designed to uncover your relationship with the Divine. Twenty years ago, everything that was good in my life was disappearing behind an eclipse. I seemed to be heading nowhere fast until a local doctor took me under his wing. During and after my time with Dr. Johnson, I found a group of Monks and began spending time with them. I went on retreats with the monks in three different countries over a period of eight years. During one of those retreats I had a mystical experience that forever changed me. I was spontaneously aware of a sacred knowledge that wasn’t mine. The maharishi I was studying with said I was, “Downloaded.” After that experience my life spiraled back into darkness, not knowing where to turn I decided to go back to school. I attended the University of Western Ontario to study Psychology and English. Over the years I have facilitated workshops and talks in schools, the Canadian Mental Health Association, Rogers Daytime TV, Unifor 2017 EFAP/Addictions Conference. In 2016, I became an Ordained Minister. Currently and in between all the above, I’ve been a self-employed tattoo artist. To date I have tattooed over 10,000 people from all walks of life. My years of serving my clients has taught me a great deal about love. As an artist, I see what the rest of the world sees, but display it back in a way the evokes the viewer to see something different. Being an artist has changed my inner landscape. It has taught me two things, how to escape my mind and how to rest deeply in the silence within me. This book began to take shape in my early twenties when I was just beginning to awaken to something within. I spent the first twenty years of my life covering myself. Then I spent the next twenty years shaking off the things I had covered myself up with. As a young boy, my grandmother invoked a tide of silence in me. At the height of my sadness, I needed the peace that my grandmother revealed to me in my early adolescence. By my twenties, the voices in my head had a choke hold on me and I reached a point where I could not move forward. My anger had come to a boil. Defeated and broken, I felt I had nowhere left to turn. In a moment of desperation, I cried out to God. “Please help.” I wasn’t religious or spiritual in the least but I was desperate. A few days later, I received a call from a local doctor who wanted to bring his nephew in for a tattoo. When he arrived with his nephew in tow, the doctor seemed out of control, as if he had had too much caffeine. He was bouncing all over my studio and, during the tattoo session, he insisted on rubbing a homeopathic cream over his nephew’s tattoo with his bare hands. I let him know that he was cross contaminating my workspace but my words fell on flat ears. His nephew’s tattoo was going to take about three sessions and, before they left, we booked him in for two more sittings. He requested that I book the next session at my last sitting of the day so I could join him and his nephew at his home for drinks. I was curious enough to agree. After the next tattoo session, I followed the two back to the doctor’s house. While the doctor and I were having a beer in his kitchen, he told his nephew to ‘get the room ready’. I was taken aback and questions were streaming through my mind. What room? Ready for what? Where was the room? But I shook off my suspicions and resolved that, if I felt things were getting too strange, I would be ready. About fifteen minutes later, the nephew reappeared, proclaiming the room was ready and I was ushered to the living room doorway. The doctor and his nephew were both wearing a look of mischievous anticipation. “You first,” the doctor said. Again, I felt things were getting a little weird but I was just interested enough to proceed. I opened the door and was greeted by a glow of black lights. Looking down the stairwell, I could see lava lamps, hundreds of records and cds and lots of psychedelic posters. Was the doctor a little crazy? It turned out that the doctor was harmless and, during my time at his home that night, we got drunk and shared some good laughs. That evening the doctor talked about a lot of things I didn’t understand. I had no idea what words like duality, androgyny, ego and unity meant. Why was he talking about the nature of my soul? I pushed him away and told him I thought he was crazy. The evening ended shortly after. About two weeks later, alone with suicidal thoughts coursing through my mind, I couldn’t stand the insanity of my mind. I decided to go for a ride on my motorcycle to clear my mind. During my ride I saw a brick building at the end of a long strip of road. I accelerated, intending to drive into the wall at about 150 km. But, as I sped closer to that brick wall, I could hear the doctor’s voice echoing in my mind as I recalled some of his words and that strange experience in his home. Even though I could not consciously comprehend what he had been talking about, my soul did. His words were now screaming in my mind. Time suddenly froze as I flew toward the wall, the experience at the doctor’s house flashing through my mind in slow motion. It was like I was back on his couch in the psychedelic room. Seconds later, I turned around and headed toward the doctor’s house. I knew he had something I needed. As I stood at his door, I barely had the courage to lift my arm and ring his doorbell. I was in a dark place and emotionally spent. I pushed the button, took a step back and waited. That was the moment my life changed. “I guess you better come in,” he replied. True desperation takes hold when nothing behind you looks good, nothing around you looks any better and what lies ahead no longer has any appeal. Moments before I rang his doorbell, I was desperate. For a reason I didn’t understand and that was much bigger than me, I had arrived. This was my point of awakening. It was up to me now to decide whether I was going to take the guidance I had asked for. I did not feel like I had any option other than to go forward. There I stood, with a handful of books and what seemed to be a faint whisper from my heart, promising great things ahead. I read the books in record time, placing sticky notes in the columns with my questions. By the time I was finished, there seemed to be more sticky notes than pages. The doctor and I became best friends and we spent a great deal of time together over the course of an eight year period. During our time as friends, he answered all my questions and some I had not even known to ask. He was the answer to my prayers. He helped me save my life. That experience was twenty years ago and my time with the doctor was just the beginning of the adventures. Along my path, I have been blessed to meet and spend time with many great teachers as well as a few masters. Some of the messages you will find in this book are things that the doctor and I talked about. While other words of wisdom found between these pages come from the eight years I spent with a group of monks. Still other teachings are from my studies at the University of Western Ontario. Another portion of this book was downloaded into me, the result of a trip I took to the pyramids outside Mexico City. Take what you like from this book and have your own experience. After years of searching for truth and peace, I have discovered that I carry inside me my own truth. No one has my truth but me. As for peace, it’s not obtained, it is already within you. Surrender to it. By the end of your life, you will have made thousands of mistakes. Those mistakes will be easier to live with than one single regret for not following your heart.